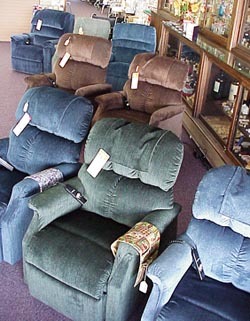 S&S Home Health keeps our showroom floor stocked with the latest models of lift chairs, but our stock is always changing. Don’t see what you want on the floor? Not a problem! We are happy to special order whatever lift chair you desire, often in just three to five days. If you require something special such as heat and massage or custom colors and materials, orders may take a little longer. Stop by and have a look at what we have on the floor or let us know what you would like. As always, we still offer free delivery in our area and the lowest prices anywhere!